To Cite: Marcon C E M, Schneider I J C, Schuelter-Trevisol F, Traebert J. Trends in the Burden of Hepatitis B in a Southern Brazilian State, Hepat Mon. 2015 ; 15(11):e31906. doi: 10.5812/hepatmon.31906. Background: Viral hepatitis is a major health problem in Brazil and worldwide. The state of Santa Catarina has high endemic areas, and the disease burden is unknown. Objectives: To estimate and analyze the burden of hepatitis B in the state of Santa Catarina, in 2005 - 2010. Materials and Methods: A time-series analysis was conducted using notification data of incidence and mortality rates from hepatitis B. The Disability-Adjusted Life Years (DALY) and the components Years of Life Lost (YLL) and Years Lived with Disability (YLD) were calculated. The annual variation was estimated using segmented linear regression, identifying the points at which there were changes in the trend. Results: The state of Santa Catarina showed an increase of 11.9% (95% CI 0.9, 24.2) per year in YLL rates. A significant increase was observed for men and within the 70 - 79 age group. There was a significant decrease of -9.4% (95% CI -16.1, -2.2) in the YLD rates per year. The decline was significant for women and within the 15-34 age group. Regarding the DALY rates, the state of Santa Catarina showed a decline of -6.6% (95% CI: -11.0, -2.0) per year. Significant decreases occurred for females and within the 15 - 29 and 45 - 59 age groups. However, there was a significant increase within the 70 - 79 age range. Conclusions: The state of Santa Catarina has reduced the disease burden rates attributed to disability from hepatitis B, but there has been an increase in the burden of premature mortality from 2005 to 2010. Viral hepatitis is a major health problem in Brazil and worldwide. According to the World Health Organization, about 600000 people die from the disease each year. Most people infected with hepatitis B do not know their carrier status and thus become an important link in the chain of disease transmission (1). Hepatitis B is endemic in China and other parts of Asia. In Brazil, the disease is highly endemic in the Amazon region. In southern Brazil, there are highly endemic areas, including the state of Santa Catarina (1-3). A study conducted in this state showed two distinct and significant trends in disease incidence in 2002 - 2009; an increase of 5.9% per year until 2006, followed by a drop of 6.4% per year until the end of the follow-up period (4). Several studies used the indicator Disability-Adjusted Life Years (DALY) to estimate the burden of hepatitis B in different countries or regions. According to the Global Burden of Disease Study (5), there was a 25% worldwide increase in the burden of acute hepatitis B rates per 100000 population, and 62.5% in the total number of DALY in 1990 - 2010. In the United Kingdom, the burden of disease was estimated as follows; a decrease of 11.6% in total DALYs, a decrease of 18.3% in rates for acute episodes of hepatitis B and an increase of 108.8% and 92.9%, respectively for hepatocellular carcinoma secondary to hepatitis B. The increase in the rates of burden of cirrhosis secondary to hepatitis B in the UK were 56.6% and 44.7%, respectively for the same period and indicators (6). Data from China (7) also showed an increase of 36.5% in the burden of hepatocellular carcinoma on the total number of DALYs secondary to hepatitis B and 25.8% in the burden of acute hepatitis, although there was a decrease of 46.1% in the burden of liver cirrhosis. In Spain in 2006 (8), there was an estimated rate of 20.4 DALY/100000 population and in Germany (9), 9.4 DALYs/100000 population in 2005 - 2007. In the Canadian province of Ontario 7004 HALY (health-adjusted life year) from hepatitis B were estimated in 2005 - 2007 (10). In Brazil, there are no specific studies on the burden of hepatitis B. The aim of this study was to estimate the burden of hepatitis B and analyze trends in the Brazilian state of Santa Catarina from 2005 to 2010. Ecological studies were conducted to estimate the burden of hepatitis B in the state of Santa Catarina in each year of the period under study. The data collection consisted of confirmed hepatitis B cases in Santa Catarina reported to the Information System for Notifiable Diseases (SINAN) of the Brazilian National Health System (SUS). Data from individuals who died from hepatitis B were obtained from the Mortality Information System (SIM) of SUS. Deaths caused by hepatitis B were those classified by the ICD-10 as B16, B16.2, B16.9 and B18.1. Population distributions by gender and age groups were obtained from SUS Department of Informatics (DATASUS) (11). The indicator Disability Adjusted Life Years (DALY) was calculated by adding the number of years of life lost (YLL) to the number of years lived with disability (YLD). The YLL was estimated by the difference between age at death and life expectancy, standardized at 80 years for men and 82.5 for women (12). A discount rate of 3% per annum was applied with the objective to avoid excessive weight given to deaths at very young ages (12). The YLD was estimated by multiplying the weight factor, defined as a measure that assigns a numerical value to the time lived in non-fatal health states, by the duration of disease (12). Hepatitis B can be characterized as either acute or chronic. 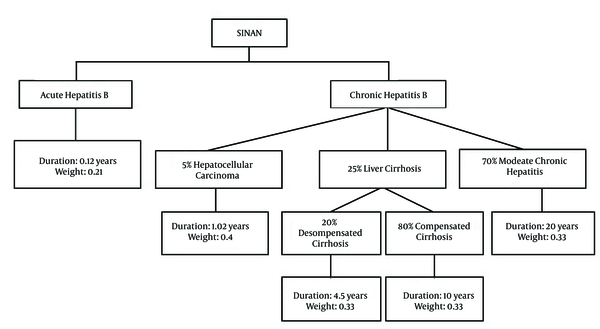 In this study, we assumed that from all patients with chronic hepatitis B, 5% progress to hepatocellular carcinoma, 25% to liver cirrhosis and 70% to moderate chronic hepatitis (12). Of patients with liver cirrhosis, 80% would develop compensated cirrhosis and 20% decompensated cirrhosis (8). The average duration of disease and weight factors for calculating YLD were the same as those proposed in Spain (8), The Netherlands (13) and Australia (14), as shown in Figure 1. Interpretation of serological tests from the SINAN data was performed to determine whether the patients with hepatitis B were in the acute or chronic phase of disease: 1) Acute Hepatitis B: HBsAg positive, Anti-HBc total positive, Anti-HBc IgM positive, HBeAGe positive or negative, Anti-HBe positive or negative; 2) Chronic Hepatitis B: HBsAg positive, Anti-HBc total positive, Anti-HBc IgM negative, HBeAGe positive or negative, Anti-HBe positive or negative. Initially, the YLL, YLD and DALY crude rates were calculated. Then, specific rates by gender and age groups were standardized using the direct method, considering the population of Santa Catarina in 2010 as the standard. Next, an ecological time-series study was conducted. The average of three terms was used to reduce the oscillation due to the small number of cases for trend detection through regression models. For the modeling process, the standardized rates were considered as a dependent variable (y), and the years of the study period were considered as an independent variable (x). The Jointpoint software (Statistical Research and Applications Branch, National Cancer Institute, Rockville, MD, USA) version 4.0.4 was used to calculate the annual variation of YLL, YLD and DALY from 2005 to 2010. The software executes a segmented linear regression (jointpont regression) to estimate the annual percent variation (APV) and identify points at which there is a modification of trend. Models were successively adjusted to assume a different number of points of trend modification, from 0 (in which the trend is represented by a single-line segment) to 2 (maximum). The model chosen was the one with the highest number of points in which the statistical significance of p < 0.05 was maintained. The annual percent variation (APV) was calculated from the estimated inclination for each line segment (regression coefficient). Its statistical significance was estimated by the method of least squares through a generalized linear model, assuming that the rates follow a Poisson distribution and that the variations of rates are not constant over the periods. For each line segment with estimated inclination, 95% confidence intervals (95% CI) were calculated (15). During the study period, 200 deaths registered in the SIM were found. The lowest rate of YLL was observed in 2006 (7.2 YLL/100000 population) and the highest in 2007 (12.5 YLL/100000 population) as shown in Table 1. The time-series study showed an increase of 11.9% per year (95% CI: 0.9, 24.2) in the YLL rates in the state of Santa Catarina. 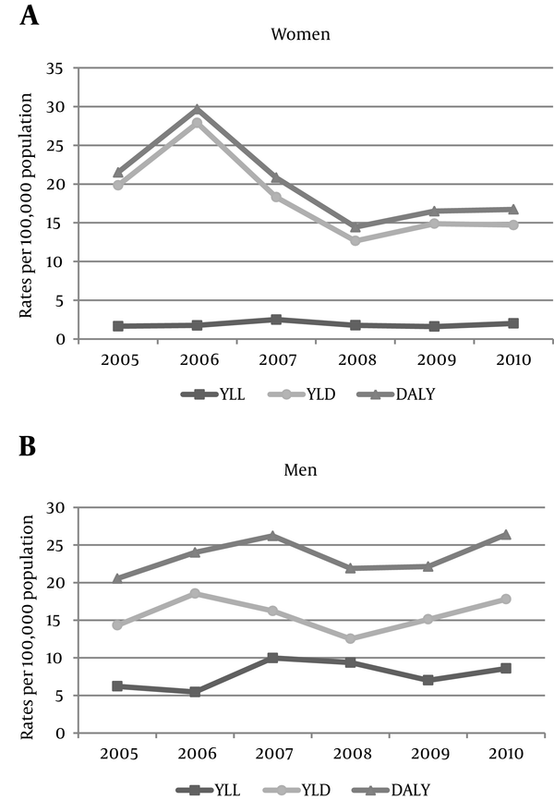 YLL rates were higher among men than women in all years of the study period. The temporal analysis showed a statistically significant annual growth rate of 14.1% (95% CI: 2.8, 26.7) among men, whereas among women, the increase was not statistically significant (Figure 2). The 45 - 59 age range had the highest YLL rates, except for the year 2010, in which the 30 - 44 age range had the highest YLL rates. Nevertheless, the only age group that showed a significant variation was the 70 - 79 age range, which increased the YLL rates by 56.4% (95% CI: 30.8, 87.0) in the study period (Table 1 and Figure 2). During the study period, 8241 cases of hepatitis B were reported in the state of Santa Catarina. The YLD rates ranged from 46.4 YLD/100000 population in 2006 to 25.2 YLD/100000 population in 2008. The time-series study showed a statistically significant decrease of -9.4% per year (95% CI: -16.1, -2.2). During 2005 - 2007, women had higher YLD rates than men, whereas in 2008 - 2010, men had higher YLD rates than women (Figure 2). However, there was a significant decrease of -14.7% (95% CI: -22.2, -6.5) in the indicator among women. The age groups 15-29 and 30-44 years had statistically significant reductions in the YLD rates in the study period as -16.5% (95% CI: -25.7, -6.1) and -5.3% (95% CI: -8.6, -2.0), respectively (Table 2). aThe values are statistically significant. According to the World Health Organization, viral hepatitis makes a substantial contribution to the burden of chronic diseases. Infections with hepatitis B and C viruses cause an estimated 57% of cases of liver cirrhosis and 78% of cases of primary liver cancer worldwide annually (16). This study estimated rates ranging between 36.4 and 53.6 DALY/100000 people. In Spain, the estimated rates were 20.4 DALY/100000 people (8) and in Germany, 9.4 DALY/100000 people (9). Substantially higher rates found in the state of Santa Catarina indicate the need for intensified prevention and surveillance. Particularly, the west region of Santa Catarina is considered an endemic area for hepatitis B (3), which certainly contributes to increase the studied indicators. In the time-series analysis, significant declines were observed in YLD and DALY rates, which may represent better public policies and care in the treatment and prevention of new cases of hepatitis B in the state of Santa Catarina. On the other hand, increased YLL rates were observed, especially among men and in older age groups that may represent advanced cases of disease (cases of liver cirrhosis or hepatocellular carcinoma) that may represent late diagnosis, which reinforces the need for population-based serological screening and enhancing immunoprophylaxis of hepatitis B in males and the elderly. A study of trends in the hepatitis B incidence in the state of Santa Catarina showed a 5.9% increase in incidence rates from 2002 to 2006, and a significant drop of 6.4% from 2006 to 2009 (4). Although neither the above-mentioned study nor the current one has a method approach with an explanatory design; it can be hypothesized that reduction in rates may be a reflection of immunization programs and surveillance activities aimed at prevention. This can also be seen in the analysis by age group, since there are few cases among children and adolescents. This could be attributed to the vaccination campaign that began in 1992 in the state of Santa Catarina for children under five and presented 98.8% coverage rate during 2005 and 2010 (17). Furthermore, the increase found in the YLL rates could evidence improvements in health information systems in Brazil (18). The male usually has a higher prevalence of HBV infection (2, 19, 20) possibly due to occupational exposure, drug use and promiscuous habits compared to women. In addition, the vaccine schedule was initially aimed to reduce mother to child transmission. The present study showed a significant increase in men’s mortality burden, which can indicate that they may not have access to early diagnosis and treatment in a timely manner. This situation highlights the necessity for effective prevention policies aimed at men’s health. Regarding disability, there was a significant decrease among women, a phenomenon occurred in DALY rates as well. Similar results were found in Spain in both early mortality and disability components (8). A study conducted in the Canadian province of Ontario found that the impact on the burden of hepatitis B was higher among men than women (10). The present study demonstrated that DALY rates had a significant increase in the 70-79 age range during the study period. These figures highlight the necessity for preventive actions aimed at elderly people, such as expansion of vaccination against hepatitis B for all age groups and campaigns that encourage immunization, since Brazil does not provide hepatitis B vaccination for elderly populations, except in high-risk groups. There is no record in the Brazilian database of hepatitis B vaccination for this age group (21, 22). The Brazilian national immunization program provides the vaccination against hepatitis B for people younger than 50 years. The vaccine was gradually introduced nationally since 1989 due to the high prevalence in the western Amazon region. The Brazilian Ministry of Health guidelines state that vaccination against hepatitis B should be guaranteed primarily to high-risk groups, even if they are outside the age range and to every individual above 50 years who seek vaccination against hepatitis B (22). In some European countries, especially in the south of the continent, the burden of chronic liver disease due to hepatitis B is increasing because of the unvaccinated aging population (21). A study conducted in China showed an increased burden of liver cancer in patients with an average age of 55 years, due to hepatitis B (7). Hepatitis B is considered a global problem with high incidence in different countries, including Brazil. Thus, taking preventive measures to control viral hepatitis is of utmost importance. Vaccination against hepatitis B is safe and effective. In many countries where 8% to 15% of children used to become chronically infected with hepatitis B virus, vaccination reduced the rate of chronic infection to less than 1% among immunized children (23). Some measures recommended by the World Health Organization tend to change the current scenario of hepatitis B. These actions include increased resource mobilization for disease prevention, with efforts to improve vaccination coverage, actions to prevent transmission of the virus, guidelines for screening, diagnosis and treatment of the disease and purposeful actions to reduce treatment costs (16). Brazilian national public policies encompass vaccination of healthcare workers, safety of injections using disposable syringes and needles in all health services, rigorous screening of all donated blood, prevention of viral hepatitis among drug users and referral network for patients with viral hepatitis (23). These policies help reduce the overall rates of hepatitis B in the country and can show a decline in the disease rates in the coming years (23). Limitations of this study include possible underreporting of hepatitis B cases, considering the long-term asymptomatic phase and underreporting of cases in SINAN and registration of SIM deaths due to undetermined causes. An example is seroepidemiologic population surveys or in groups with greater vulnerability with high rates of HBV infection (24-27). Therefore, the findings should be interpreted with caution, since underreporting of cases can interfere with disease burden presented in this study. There is an urgent need to raise awareness of healthcare workers to investigate and report all cases of hepatitis B. This measure would allow access to more comprehensive data about the disease, and can help plan actions to improve early diagnosis and treatment of the disease. Moreover, considering the natural history of the disease, it is estimated that only cases with greater severity and presence of signs and symptoms are investigated and reported. A significant decrease in the burden of hepatitis B rates and disability components in the state of Santa Catarina between 2005 and 2010 was observed. However, there was a significant increase in the early mortality component rate in the same period. Authors’ Contribution: Study concept and design: Chaiana Esmeraldino Mendes Marcon and Jefferson Traebert; acquisition of data: Chaiana Esmeraldino Mendes Marcon; analysis and interpretation of data: Chaiana Esmeraldino Mendes Marcon, Ione Jayce Ceola Schneider and Jefferson Traebert; drafting of the manuscript: Chaiana Esmeraldino Mendes Marcon, Ione Jayce Ceola Schneider and Jefferson Traebert; critical revision of the manuscript for important intellectual content: Chaiana Esmeraldino Mendes Marcon, Ione Jayce Ceola Schneider Fabiana Schuelter-Trevisol and Jefferson Traebert; statistical analysis: Chaiana Esmeraldino Mendes Marcon, Ione Jayce Ceola Schneider and Jefferson Traebert; the study supervision: Jefferson Traebert. Funding/Support: This study was supported in part by a scholarship from the FUMDES/Government of the State of Santa Catarina (Dr. Chaiana Esmeraldino Mendes Marcon).